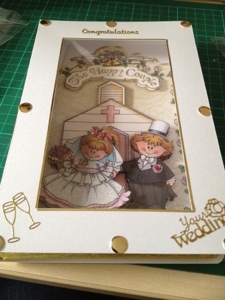 I have made this card for my neighbour's daughter who will be getting married. 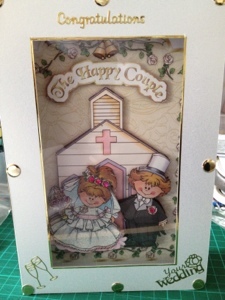 I have made it like a book and used the the happy couple decoupage paper that was free in the papercraft essentials issue 83. I have used gold crepe paper, pink gems, gold card candi, and gold peel offs. A lovely wedding card! Loving the images and a fabulous idea in making it into a book. This is sooo sweet - love it! brilliant, this is also a wonderful wedding gidt as well as a card. I love how you've made this card up so dimentional. It's a cute image you've chosen as well.